More gold is coming home to Gainesville. 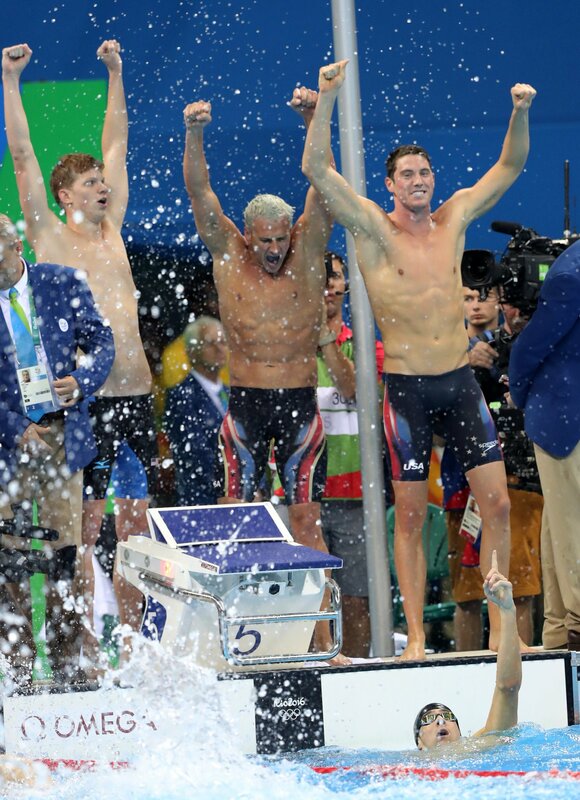 Former Gators Conor Dwyer and Ryan Lochte formed half of the gold medal winning men’s 4X200M freestyle USA team. Dwyer led the race off and completed his split in 1:44.49 and giving nineteen year old Townley Haas a large lead. Haas finished his 200 meters at the 3:29.37 mark. Ryan Lochte, the most decorated Gator olympian competed his run at 5:15.40 before giving anchor Michael Phelps a huge lead. The USA finished in 7:00.66 almost three seconds ahead of second place Great Britian. For Dwyer this was his second medal of the 2016 Olympics. Dwyer earned a bronze medal in the 200M freestlye event on Monday. Although Lochte had the worst time in the final, he actually posted the best time in the qualifier earlier in the day as the anchor. Phelps earned his 21st gold medal in this event just a short time after earning his twentieth in the 200M butterfly. Phelps is the most decorated American swimmer ever and continues to dominate.